San Diego’s Catholic bishop is undergoing treatment for prostate cancer, the diocese announced Monday. Bishop Cirilo Flores is also still recovering from the effects of a stroke he suffered in his office on April 16, according to Monsignor Steven Callahan. He said Flores is being treated at the USC Norris Comprehensive Cancer Center in Los Angeles. The extent of the cancer is unknown, he said. Flores succeeded Brom as bishop last September. The 65-year-old Corona native graduated from Loyola Marymount University and earned a law degree at Stanford University before attending seminary school. He spent many years as a priest in Orange County after being ordained in 1991. 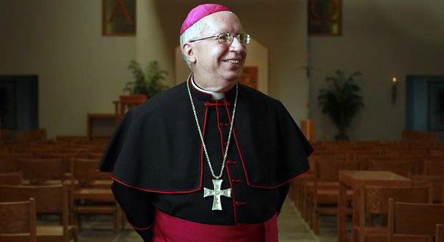 He was named an auxiliary bishop in 2009 and a coadjutor bishop in 2012.